Beat 4 is spectacular! 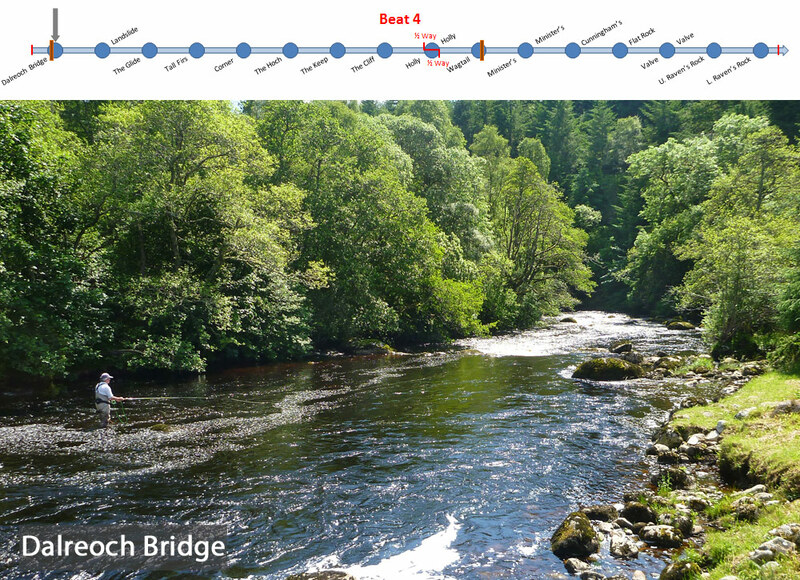 It starts in pasture, with the Dalreoch Bridge pool. The footbridge on the Bridge pool can be crossed to fish the Bridge pool and Landslide and the small pool between them, from the left bank. The next pool down, the Glide, fished from the right bank is also very productive, especially in high water. At the Corner pool the gradient increases and the river starts to cut through sandstone and conglomerate creating a number of large deep holding pools such as the Hoch, Cliff, Holly, Minister's and Cunningham's with backdrops of high cliff faces and giant conifers. 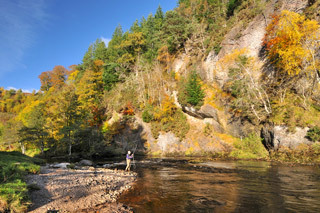 The upper half of the beat, extends along the right bank to the tail of the Holly pool, access to fish this pool provided by a catwalk along the cliff face. A crossing in the middle of the beat, lost in the flood of October 2006, was reinstated over the tail of the Wagtail pool in 2012, and provides access to the left bank in all water conditions. The lower half of the beat now starts at the top of the Holly pool on the left bank; thus the Holly pool is shared by anglers on both halves of the beat, but priority is given to anglers fishing the upper half of the beat from the right bank. Immediately below the footbridge on the left bank, there is a catwalk along the Minister's pool, that connects to a pathway to Cunningham's, Flat Rock and Valve. On the right bank, there is a short section of catwalk along the cliff at Cunningham's, but this pool is best fished from the left bank. There is also access to the Valve pool further downstream from the right bank. The beat ends with the two stunning and extremely productive pools at Raven's Rock. NB: for best quality, if your bandwidth allows, click on the YouTube logo on the embedded viewer above, select 1080p HD and view in full screen. * The image of Landslide above has been provided courtesy of Trout & Salmon magazine, and was photographed by Peter Gathercole. A big thank you to Peter & Andrew Flitcroft. We are slowly building an archive of video clips from each of the Novar beats. Click on the links below to see videos from Beat 4 on the SalmonQuestTV channel on YouTube. Each video will open in a new tab. Some of the shorter videos clips just comprise a brief tour of a pool; others include action footage of our guests playing and landing fish - enjoy! All videos are in HD and best viewed in full screen at 720p or 1080p HD setting. Follow Novar Beat 4 Photos on Pinterest.